Role in Playtime Kingdom? Hyper, speeding fluff bullet! Aside from zooming around, she’ll also try and find any corner to bury her adorable face in. In a way, she’s like the speedy prisoner of the kingdom, but only because she created that role for herself in her own mind. Most of the time, she scares herself! Favorite Hiding Place? Any tight space, far from the reach of humans. She enjoys following her sister Lulu around during playtime, but will be the first to dart behind any object at the first hint of feeling threatened (i.e. any soft, meandering human shuffle will warrant a disappearance)! Physical Capability? Fast as a speeding Fifi! This darling will bolt, squirm, wriggle, jump, and burrow like every day is her last. Her strength is her awesome speed, followed by some wall surfing. Her physical capability comes from her level of personal anxiety – I know this because she comes from a sweet home, has the sweetest sister, and has a sweet mom that spoils her at every turn (me!). Despite her loving conditions, Fifi has a sometimes frustrating attitude that attempts to antagonize every situation before even reading it! Vocal? She’ll bark if she’s in her cage, because she never wants to come out for weighing, dusting, or playtime – but when she’s out, she’s really quite sweet. Human Cuddle Status? Trust is a problem with Fifi, unlike her loving sister. So, she gets all her cuddles in with Lulu in the cage. Favorite Way to Be Picked Up? Not applicable! Fifi hates being picked up, but if imperative, it would be by the torso and base of the tail – just like Lulu. Intelligence? Unknown. I believe Fifi is intelligent, but it’s clouded behind her anxiety and fear. Such a shame! I hope that over time – I’m talking years and being hopeful in that sentiment – she’ll be able to relax and come to terms with the fact that she’s always very safe with mom. Is She Compatible with Other Chinchillas? Not really. She’s a sweetheart with her sister, but she’s too unstable to trust with any other chinchilla. Ready for a Photo Shoot? No.. you’ll notice a lot of Fifi’s photos are either taken while she’s in the cage or having a very rare calm moment – although this lady is extremely photogenic when she’s able to be captured! Love to Dust? She’ll give it a roll or two, but she’s not crazy about dusting. As the chestnut praline lattes spiral gloved hands and Christmas tree shops begin to adorn every corner, it’s inevitable to fight it – Holiday Cheer is headed our way! As soon as the Thanksgiving bird is carved, Christmas sparkle starts to infiltrate our spiced cinnamon veins, trickling slowly to our pulsing glitterati hearts. We love this season! The city has been absolutely glimmering. With the bittersweet entrance of winter, we start bundling up in hats and scarves – and we can’t help reminiscing about yesteryear and futurescape. The falling leaves, the harsh wind’s kiss, the soft flutter of snowflakes. It’s important to remember: yes, while this time of year is tough and frigid, it’s romantic as well. This time is as important as any other in our lives. After all, we’re together for now, aren’t we? While we’ve had a barrage of family visiting from nearby states and overseas alike, we’ve found a way to incorporate chin-love into the center of the holidays. Sure, we traipse the incredibly shimmery streets of New York City during the day while the chins are snoozing, but upon our return, we shower them with holiday cheer and endless love! That’s what the holidays are all about – forcible cuddling (just kidding! ), delicious treats (sparingly! ), and family. And yes, of course – I conducted a full-on holiday photo shoot. No shame, only props and sweet misbehaving chinchillas! Photos will be released on our Facebook Page throughout this lovely month! I’m also thinking of doing another shoot with snowflakes and drums (think snowy little drummer boy scene) – but we’ll have to wait til the excitement of this week’s shoot has calmed a bit. Luckily, this shoot required no treats and that is a great thing – it means more shoots and more obedient, healthy chins. Anyhow, as things are regulating lately, I’ll be posting every Wednesday here on the blog! There will be daily postings on Instagram, Twitter, Facebook, weekly on YouTube (be sure to subscribe!). The whole family wishes you a great start to your December! Bonjour, chin-loving friends! 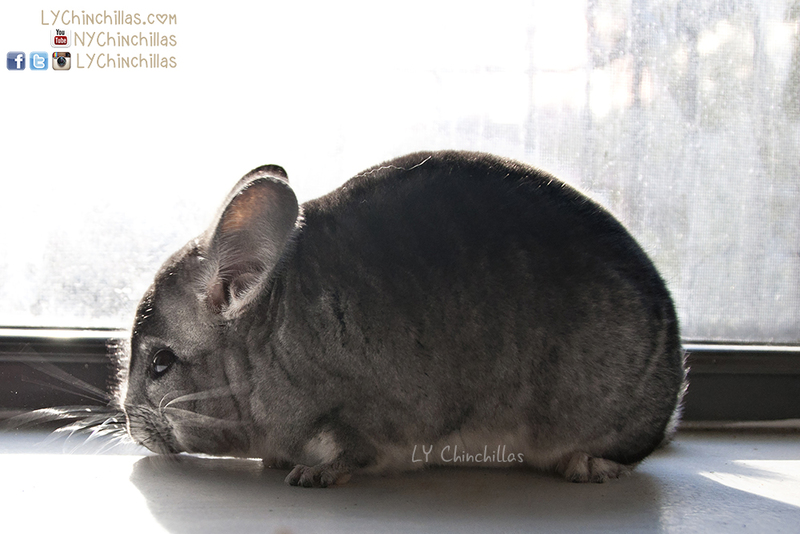 Welcome to my chinchilla blog, where I’ll be sharing a mighty important sliver of my busy NYC life with you – the love I have for my five amazing chinchillas! Let me tell you a story about the last potential roommate I met, to preface my NYC chinchilla story. When I was deliberating whether or not to move out of a friend’s apartment and into my own place, I interviewed a lovely young girl who was fresh out of college and had just started working in administration at Columbia University. By all accounts, she seemed responsible and busy, which is an ideal roommate in this city (harder to find than you would dare to imagine!). After a brief meeting, we were all standing in the apartment and she goes, “you want to know something funny?” and we eagerly respond, “Yes!”, in the mood for an awesome joke or hilarious anecdote. Instead, she starts giggling manically and yells out, “I MOVED TO NEW YORK CITY TO FIND LOVE!” and the way she said it (arms flailing and burping out the giggles), coupled with the idiotic sentiment, rendered the apartment completely silent. I thanked her for the time and cemented the move on my own. As awkward as that experience was, it goes to show that love can move mountains. Or at least, move an impressionable young person to a metropolitan area. Regardless, the point I’m trying to make is that maybe she was right. Even though I certainly did not move to NYC to find love, I did. I met my five babies. And I couldn’t be happier with them, and their myriad of personalities and particularities, and with the stress and worry they bring, as I’m sure all children do. I love my chins, and I’m so happy to share that with the world. It’s a long foreseeable future with them, and a continual learning curve – even in the simple maintenance of these lovable creatures. All chins were purchased around 3-4 months old, and are now ranging from in years. They are still in their childhood, and are growing alongside my young adulthood. I’ve been a very responsible pet owner, cramming as much knowledge as possible from reliable vet and breeder resources, along with reading up on books, blogs, and forums. There’s a seemingly infinite amount of knowledge out there, and always more to learn, which is why I’m excited to be bringing some of my most helpful learning points to you, over time. Stay tuned, follow, and keep checking back!